Tuesday’s exciting results from across the country underscore the important roles that both technology and grassroots organizing play in winning elections. Particularly in congressional and state legislative elections, we saw Democrats routing their Republican opponents from New England to New Mexico, propelled by historic levels of volunteer energy and voter engagement. In 2018, we saw two main takeaways from these elections: First, down-ballot campaigns’ adoption of technology, leading to increased campaign efficiency. Second, those campaigns’ abilities to harness an unprecedented level of volunteer enthusiasm. This cycle, campaigns relied on technology and data like never before. Traditionally, the use of advanced digital tools, mobile canvassing apps, peer-to-peer messaging services, and other political tech platforms have been relegated to large statewide or nationwide campaigns with ample resources and lots of staff. Small, down-ballot races and smaller organizations historically cut turfs containing basic voter lists in VAN, printed walk sheets, and relied on a few volunteers to knock doors or make phone calls. That changed after the 2016 elections. 2018, just like 2017 in Virginia, saw small state legislative and congressional campaigns rallying dozens, and even hundreds of volunteers to knock, call, text, and email supporters using a variety of tech tools. In 2018 alone, our Innovation Platform expanded significantly, and we powered hundreds of integrations across 6,948 campaigns and organizations. 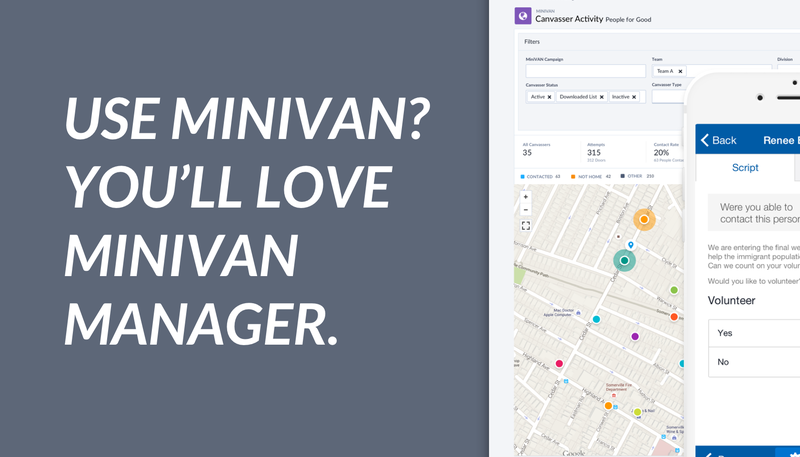 One of the most widely-used technologies this cycle among progressive organizations and Democratic campaigns was the mobile canvassing app, MiniVAN. Use of MiniVAN and MiniVAN Manager surged this cycle, with over 453,000 unique app downloads. For several weekends before election day, MiniVAN was even trending nationwide in the app store, on par with Tetris. Seventy-one percent (71%) of all progressive and Democratic door knock attempts were made using MiniVAN, a 200% increase in adoption over the 2016 cycle. Progressive organizations and campaigns for U.S. House increasingly relied on the app, with record usage in places like California, Texas, and New York – states where Democrats flipped key districts. Another new innovation that saw significant adoption this cycle was NGP VAN’s marketing automation tools supporting volunteer recruitment workflows. One example of this was a high profile U.S. Senate campaign which used Online Actions + Targeted Email in VAN in order to recruit volunteers. The campaign combined a Slack channel with NGP VAN’s Online Actions forms to collect volunteer sign-ups and reach out to prospective volunteers immediately. “I set up a Slack channel so that every time someone signed up online, it immediately pinged the relevant Field Organizer, and the Organizer called the volunteer within 10 minutes to schedule and confirm their volunteer shift. We’ve been doing that for weeks now and our online volunteer conversion/completion rate is now 60%! 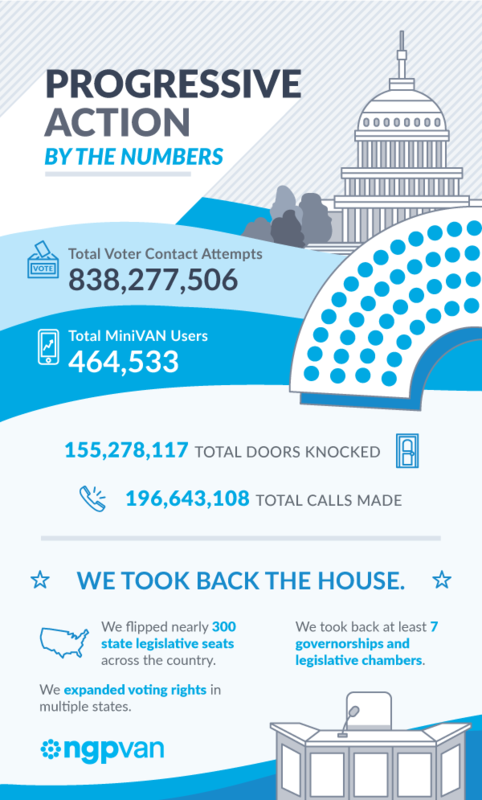 A ‘call them immediately’ mentality plus NGP VAN’s integrated tools helped us net thousands of additional door knocks,” said the campaign's Data Director. 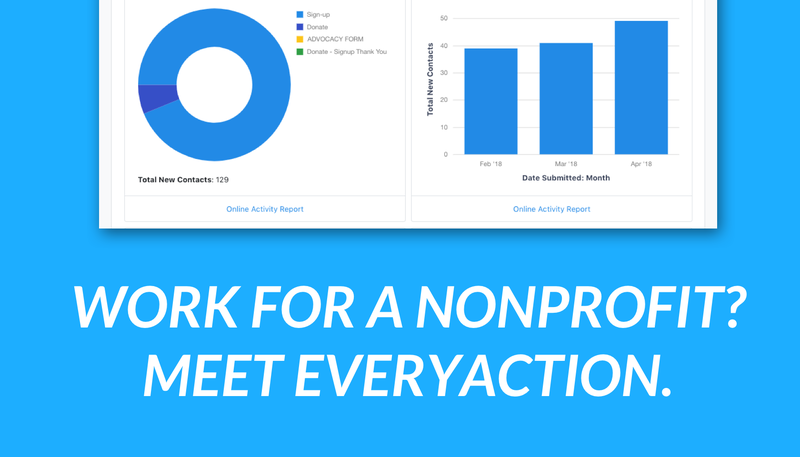 Additionally, conversion rates on NGP VAN’s online forms out-perform the industry standard because of FastAction – a feature that draws from nearly 100 million stored profiles to pre-fill forms with supporter’s information, making it easier and faster for volunteers to do everything from donating to their candidate to signing up for an event. More campaigns than ever adopted NGP VAN’s digital tools this cycle for email, online fundraising, and digital organizing. Dozens of top congressional campaigns sent millions of emails using Targeted Email, and hundreds of campaigns raised millions of dollars with NGP VAN’s Online Actions. 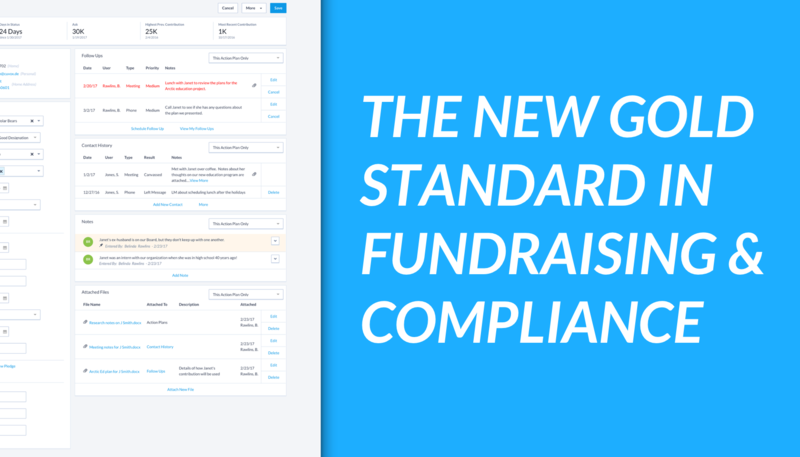 Plus, our digital tools are directly integrated with NGP’s compliance reporting, making campaign finance staffers’ jobs way easier. We also released deeper integration with our VAN events, unlocking the ability for organizers everywhere to create beautiful event RSVP forms with the click of a button, and having those signups show up automatically back in VAN. A major result of Trump’s election to the Presidency was a massive wave of resistance from the progressive community. In 2017, we saw that resistance mobilize into large protests like the Women’s March, and in 2018 the resistance galvanized and organized into a serious electoral force. Down-ballot campaigns that traditionally ran on a few dozen volunteers were flooded by hundreds of people looking to help knock doors, make phone calls, or send text messages. This led to a dramatic increase in the total voter contacts of progressive organizations and Democratic campaigns nationwide. In 2018, progressive groups and campaigns made over 838 million voter contact attempts, compared to 550 million in 2016. They knocked on a total of 155 million doors, made 196 million phone calls, and sent 195 million text messages. That level of all-out electoral organizing across all our clients is completely unprecedented – a 46% increase in overall contact attempts from 2016, and the most attempts in history. This activity also wasn’t limited to a handful of campaigns or states. We saw user and contact growth up and down the ballot and for important ballot initiatives across the country. As we look forward to the next cycle, we anticipate this wave of organizing sophistication to continue and grow. We’re grateful to be a part of Tuesday night’s progress, and look forward to supporting all of Democratic and progressive work to move our country forward. On to 2020!